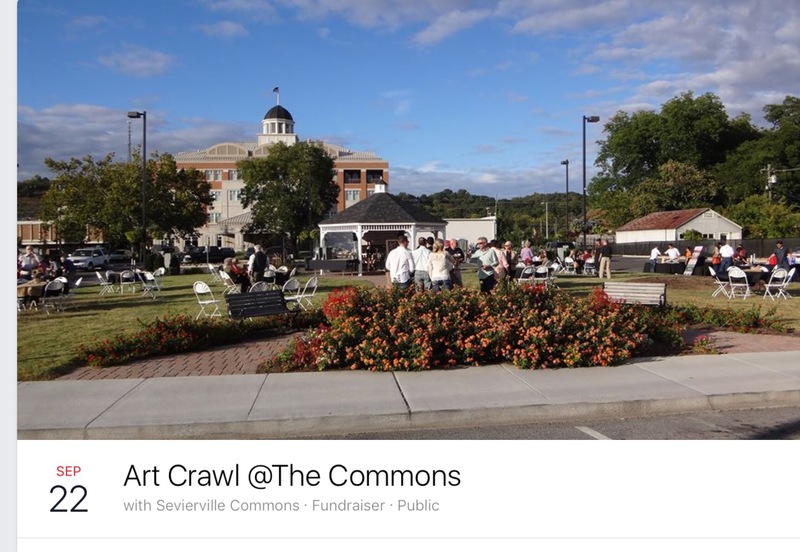 It was perfect weather for the Art Crawl @ the Sevierville Commons last Thursday evening. 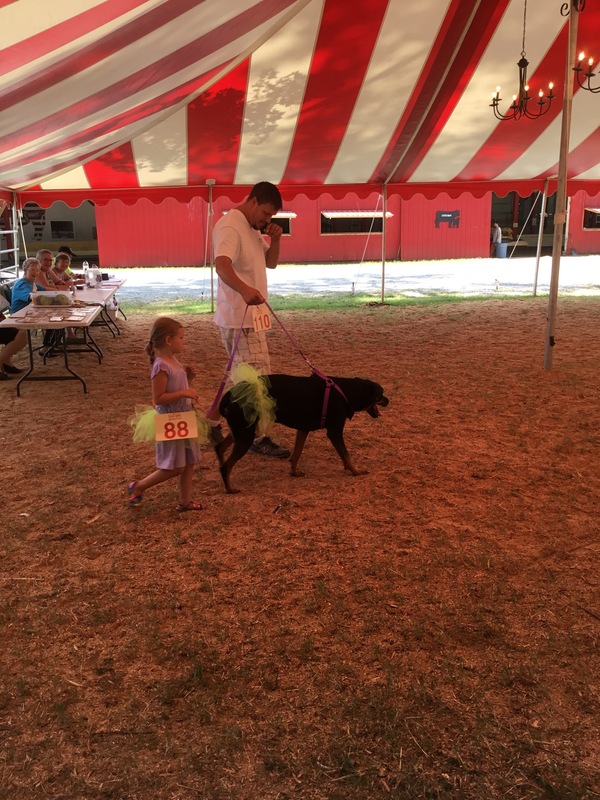 I must say…it could not have been an easier, more relaxing, enjoyable event! We were greeted by Arts Commons members, Stefanie Johnson and Anne Hewitt. They told us how things worked since it was our first visit to the Art Crawl. There were two rows of booths flanking the gazebo containing food and beverage samples. We decided to start with the shaded side. Melinda Derrick, pictured on the left, Sophia Conerly pictured in the middle, and Sofia’s daughter pictured on the right. Jill Greene and a fellow artist in attendance. Amelia and Louis duo. (John on Saxophone). What wonderful jazz music to accompany the evening festivities. My favorite restaurant, Bistro 109. The Waldorf salad was divine, as was the orange cranberry chicken salad sandwich. The Old Mill was well represented in both food and art. Here are potters who create wonderful things for the Pigeon River Pottery store. They explained the creative processes to me. I have visited that store many times and always enjoy it! The Schmutzers enjoying an exceptional evening in downtown Severville at the Art Crawl. David Elrod and colleague were most helpful during the evening , exuberant hosts. Courthouse Donuts never disappoints! Always love the presentation. Chuck never looked so good as he did posing in this picture! This year, the Art Crawl event featured pottery. Everything was so beautiful. I wanted it all! Dr. William Pippin and Emily Kile supporting the Art Crawl. WineShop at Home with Charlotte Tatum. Food was expertly paired with beverages. There were few lines and the vendors were eager to show you their products in a festive environment. My friend Sheley and I enjoy Healthy Balance and highly recommend it! A brisket slider topped with the best bacon. The Diner may have the best desserts in town. I took a slice of cheesecake ‘to go’ for lunch the next day. Unbelievable! This local business recently won international awards for this product produced in Wears Valley. It was paired with Mae Mae’s Lunchbag. The sun began to set and the temps became very comfortable. A light breeze stirred as we heard soft jazz playing from the gazebo. You won’t find a better way to get out and about in Sevierville. and the Sevierville Commons Arts Council. For these pictures and more, go to the Out and About in Sevierville Facebook page. A lot of activities are coming up in the next two weeks! First, if there are enough signed up for this cooking class then this is a guaranteed winner! 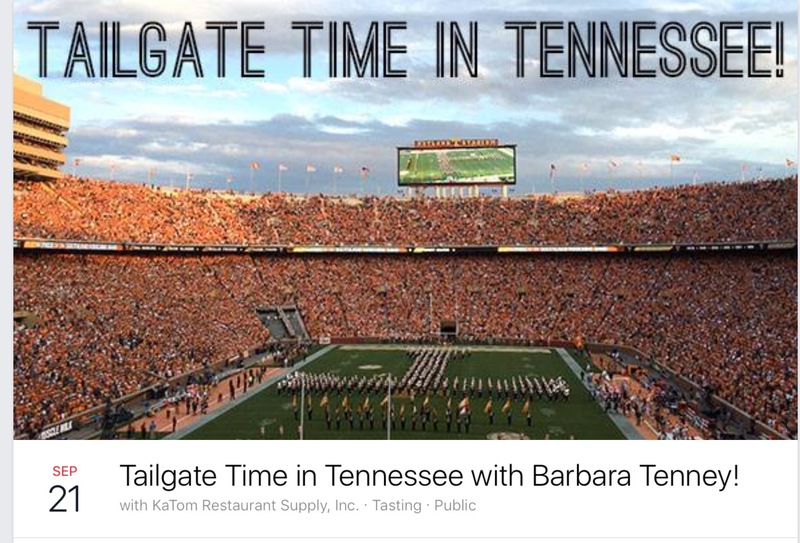 Barbara Tenney is a cooking expert in the area and a favorite on WBIRTV too. 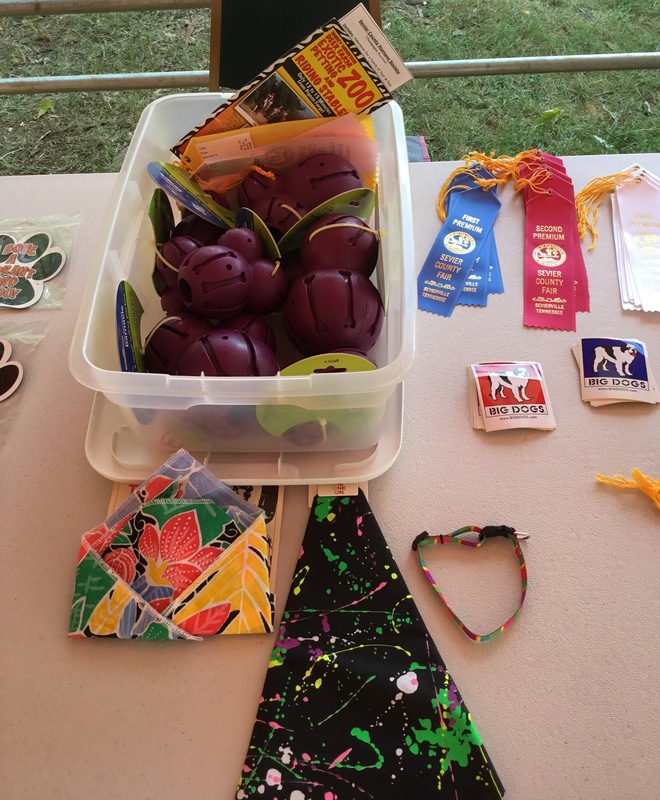 In its third year, the Art Crawl will feature pottery by several local artists. Buy tickets for the Art Crawl at any branch of Citizens National bank. Saturday will be the test for the Tennessee Volunteers. Florida! 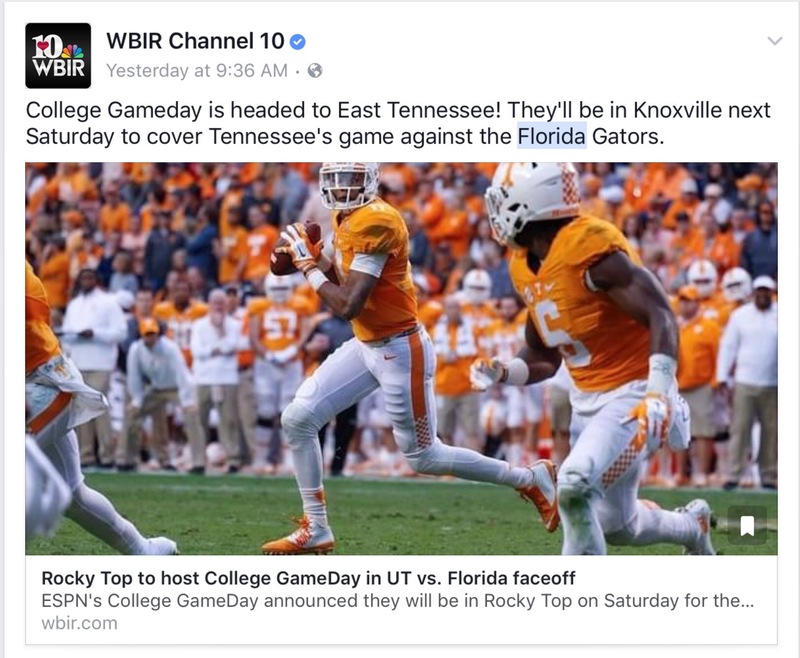 GBO! I love this meme that my friend Katherine posted recently. 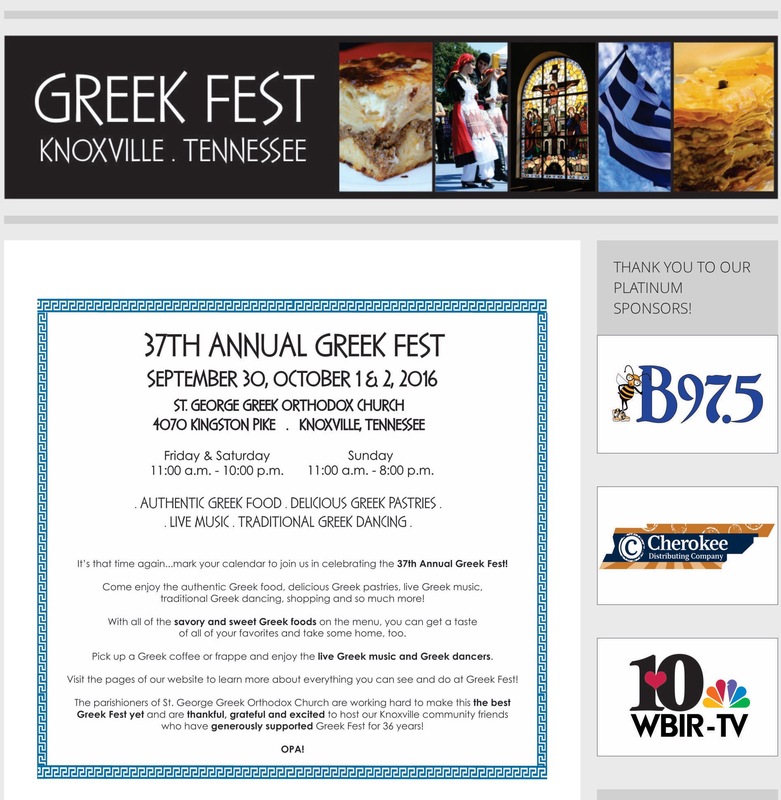 Next week features my favorite event in Knoxvegas. Save some baklava for me! 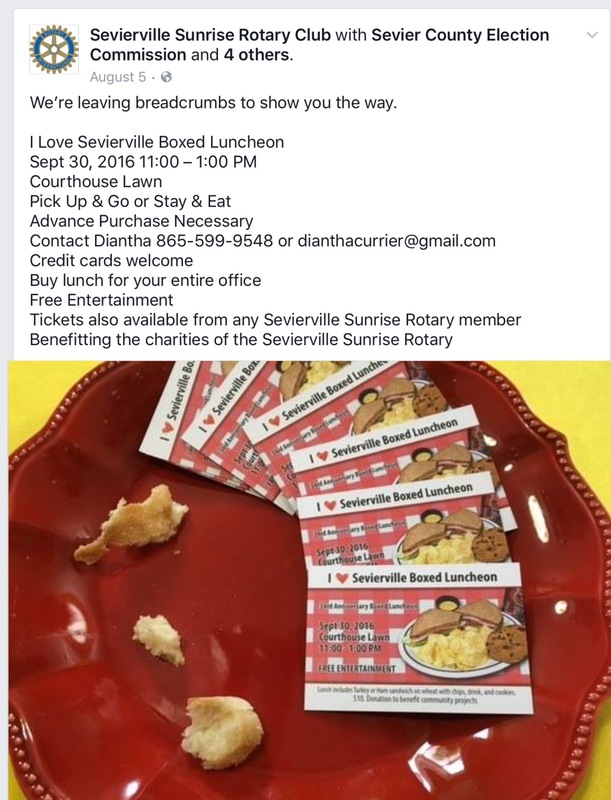 Next week, Sevierville Sunrise Rotary Club serves up a lunch during the I Love Sevierville event downtown on the courthouse lawn. If you work downtown, or will be visiting, call by this Wednesday to reserve your box lunch. These is a significant service to our community so they deserve a huge turnout! Come out to enjoy lunch and entertainment in downtown Sevierville. There will be a lot going on in the next two weeks. 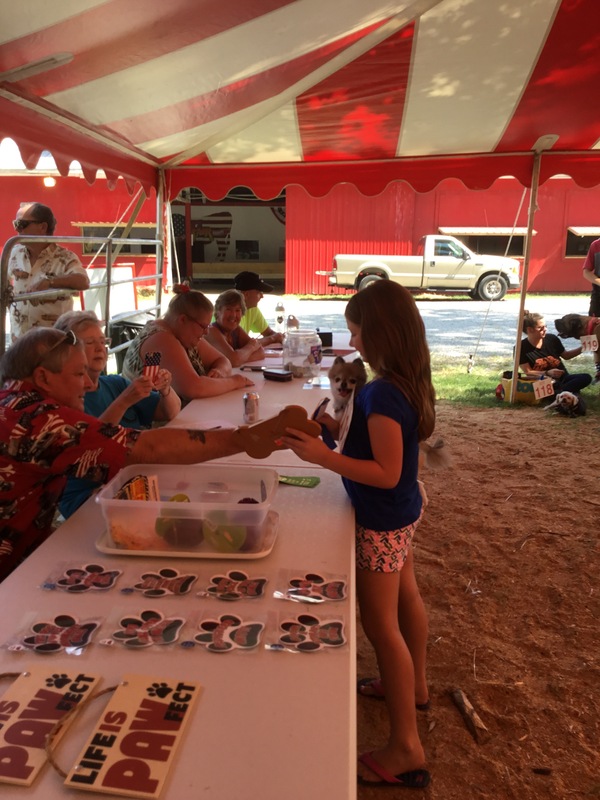 Quite the Treasure: Treasures From the Heart store benefits Sevier County. My friend Elaine volunteers at the Treasures From the Heart store in downtown Sevierville, sponsored by SMARM (Smoky Mountain Area Rescue Ministries). Two weeks ago, she asked us to come visit the store after our get-together at the downtown Farmer’s Market, followed lunch at Courthouse Donuts. If it is a store then we must go! Treasures From the Heart is close to downtown. It is located on 230 Court Avenue, just a couple of blocks walk from downtown Sevierville. So off we went to investigate further on foot. There was a Ladies Night Out event last month to introduce people to this unique store. I was unable to attend; however, the pictures and comments on social media later showed that the event was a great success. I was curious. Now, I can see why it was so popular. Whoever fashioned these store windows did a fabulous job! Very inviting. Makes me want to run in and look at all the dresses! 100% of the profits stay here in Sevier County and benefit our citizens. Elaine said that a large portion of the proceeds directly help children. The store is very clean and organized. Very pleasant. I felt like I was in a regular department store. Someone told me that the building is where Dolly Parton held her first performance. That is a huge reason to visit! I found quite a few things that I would consider treasures—some things that I have looked for in Knoxville thrift stores, but had never found. Not found until I looked at Treasures of the Heart store in Sevierville. The price is right. And you never know what you may find. Sports fan logo clothing. Go Vols! Bangles, bracelets and other jewelry. Nicely arranged! These dresses were exquisite. I was impressed with this area. This dress is a showstopper! It had matching shoes too. Golf irons and woods to hit the greens. This jacket was nice! Name brand, better price. Did I mention that Treasures of the Heart in downtown Sevierville applies 100% profits to our county? A great selection of beautiful glassware! Almost every kind. I don’t have room in my cabinets, but I may try to make some space. This is the only store that donates 100 % of proceeds to our citizens in Sevier County. Did Dolly once use these steps on her way to her performance in this building? I’ll bet she did. Walk in Dolly’s footsteps here. There was only one of these ‘horn of plenty ‘ holiday silicon baking forms. November is just around the corner. Belts cost a ridiculous amount of money, even at discount stores. Look what you can find at Treasures of the Heart in Sevierville. This store donates 100% of the proceeds to Sevier County citizens. Did I mention that already? There is so much more to find at Treasures of the Heart store in Sevierville. Find these pictures and more at the Out and About in Sevierville Facebook page. 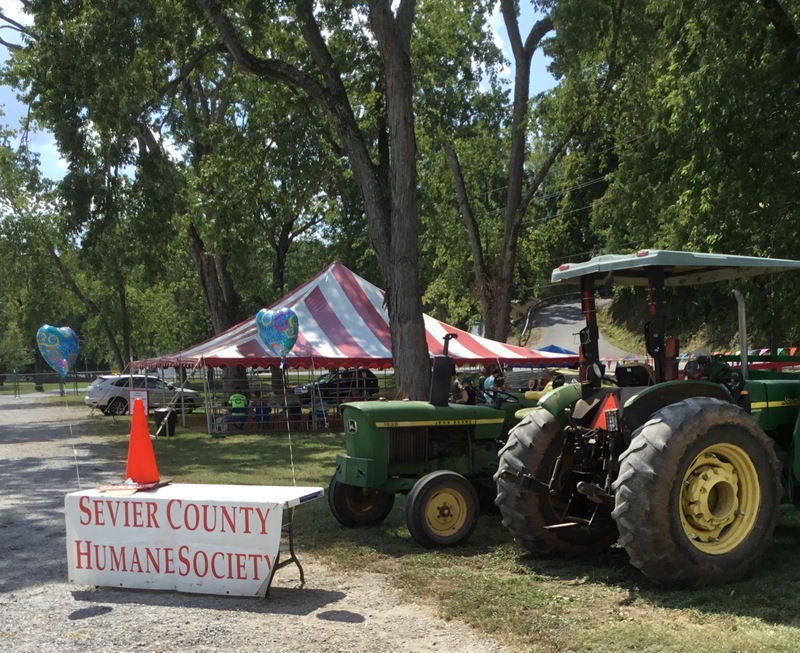 It was a nice September evening for our first Taste of Autumn event, presented by the United Way of Sevier County. We made our way through the Sevierville back roads to avoid rod run traffic and to arrive at the Gatlinburg Convention Center / the WL Mills Conference Center in time for this unique event. Friends gathered at table five with our generous host, Dr. William Pippin. I was honored to sit with VIPs at the Pippin Dental Care table. And what a fun group it was! It was nice to get out and about with VIPs like Sheley and Joey Rose. It was a treat to sit with local VIPs, Larry and Janice Sorrell. Food booths were along three sides of the room. There was almost too much to choose from. The Margaritaville gumbo was great and I would definitely order it at the restaurant. The beef brisket sliders from the Park Vista Grill were one of my favorites. Bubba Gump’s shrimp and grits helped them win most of the tokens that attendees used to vote for ‘favorite restaurant.’ They won the event for most popular food, the Golden Spoon Award. Who can argue with shrimp and grits? Some people don’t mind if you take their picture. Super nice booth for Fox and Parrot and Wine a Little Wine Bar. Need to revisit the Fox and Parrot Tavern on Glades road in Gatlinburg in the near future. Others like to make a memorable photo too. Fun booth, this one! This one was one of my favorite booths. Please come back next year! An excellent Master of Ceremonies. Amy Harper, Executive Director of the United Way of Sevier County. So fun meeting Henry Cho before the show. 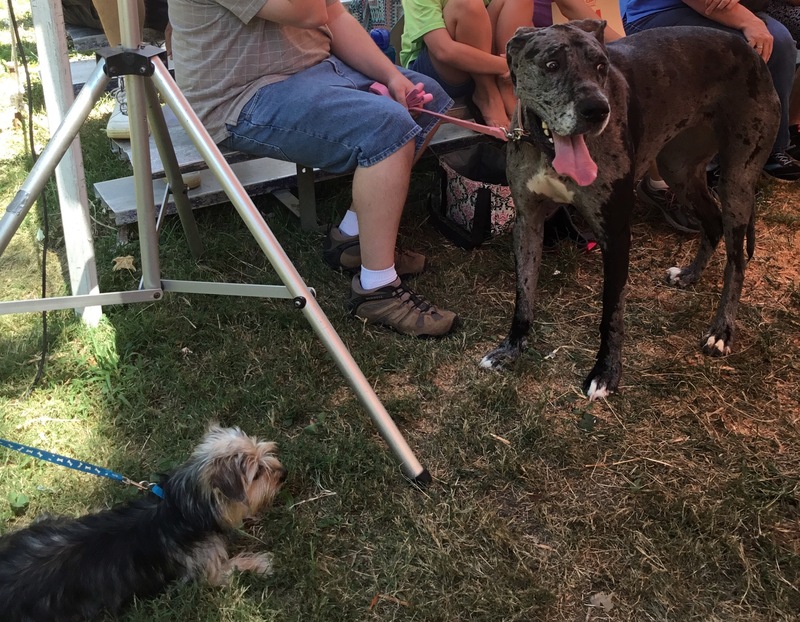 Here is a picture of Henry Cho having his picture made with Dr. Pippin. I had wanted to see Henry Cho last year when the tour brought him to Knoxville, his home town. When I heard that he was performing at the Taste of Autumn then I knew it was a ‘must see’ event. It did not disappoint! His humor is clean, yet it has a keen edge. He points out truths that we all see in life. 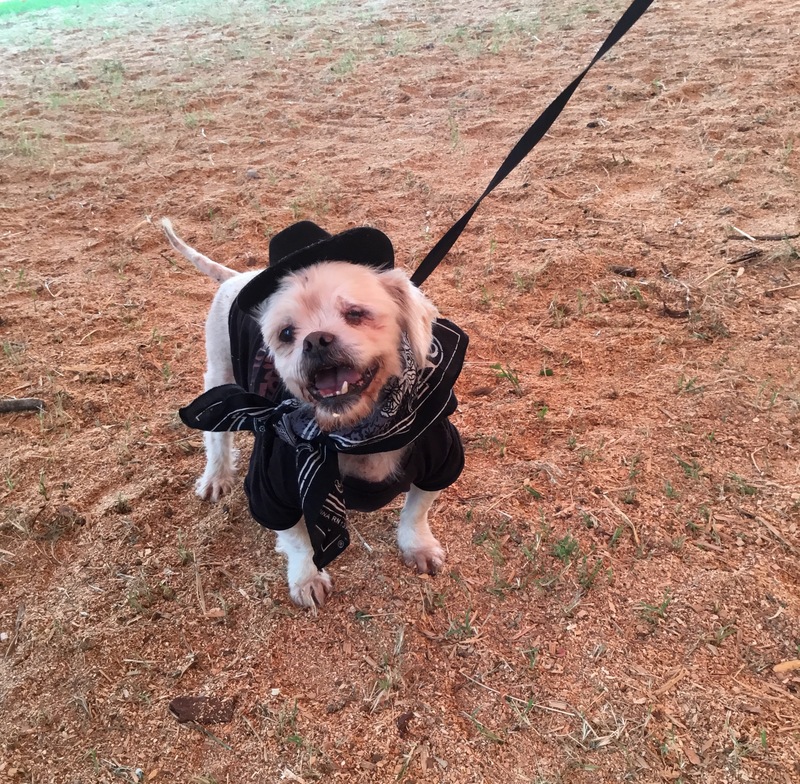 He also deals with stereotypes in a gentle, playful, yet hilarious way. Married couples and parents will really appreciate his comical observations of life. We had a great view and laughed for the duration of the show. My favorite jokes were too many to name. He picked people out of the audience during parts of the show and we were nervous that he may turn his attention to us. All was well. We were spared any comedic jabs and enjoyed it all. He is one of the best comedians around today. If you ever get a chance, you must see Knoxville’s own Henry Cho! As we walked out of the convention center, we enjoyed the nice evening sunset with nice temperatures. And an iconic Gatlinburg night scene. To be sure, the Taste of Autumn 2016, presented by the United Way of Sevier County, was a wonderful event and should not be missed. It takes a bit of effort for me to leave from work to arrive by 5:00, but it was worth it. Even more, it helps the United Way of Sevier County, an agency helps more than 15 non-profits in our area. The United Way goal this year is to raise more than $525,000. This event kicks off the fund raising year so let’s get behind them to meet this goal! Go ahead and pencil The Taste of Autumn into your calendar for next year. 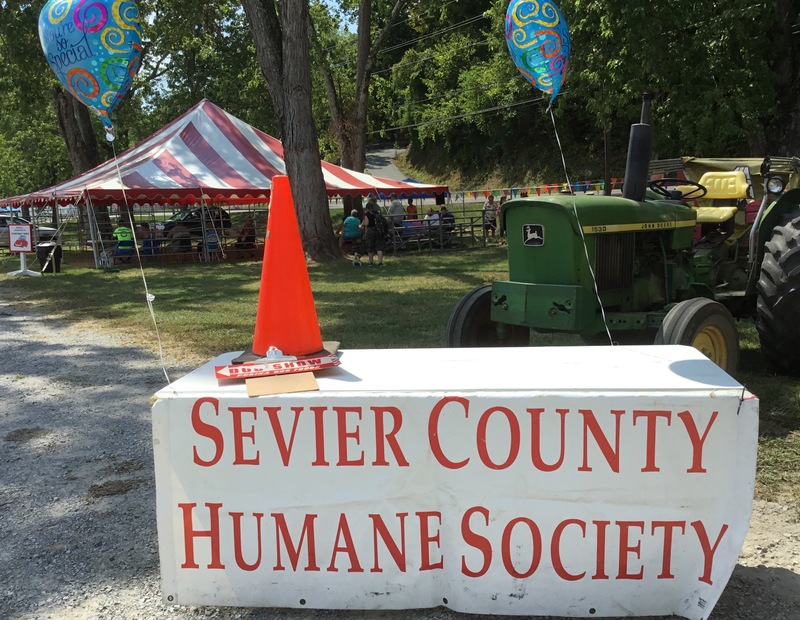 It is one of the best September happenings in Sevier County. Look for more pictures on the United Way Facebook page. I will post more pictures tonight on the Out and About in Sevierville Facebook page. I have never been in an Aldi store so I took off after work and went there yesterday, opening day. Boy, was it crowded! Lots of people had the same idea on the grand opening day. I had a quarter ready because I had heard that you used them to get a cart, then got the quarter back when you returned the cart. Thus, reducing a need for employees constantly returning carts. However, for grand opening week, they have quarters in the carts for your shopping convenience. A grace period for carts free of charge. A great first impression! And just what some of us can use after work—a sample of chocolate! The prices were very good for organic dark chocolate bars. I liked the German foods and am getting into the mood for fall. Octoberfest on the way. Lots of unique vino brands. Good prices on produce. Here is an example. I can only find a hummus quartet at Costco or Trader Joes, so I’ll definitely go back for this. This is popular on grand opening day. For my friend Leisa. Strudel! Some interesting desserts in the cooler. Restrooms by the front door. Be warned—it is a single. Just so you know. I enjoyed seeing the store and will go back when the crowds go down. It was so crowded yesterday that I returned my cart so I could just walk freely without it. Aldi brings some unique products to Sevierville. There is even more to see. There will be more pictures posted on the Out and About in Sevierville Facebook page today. 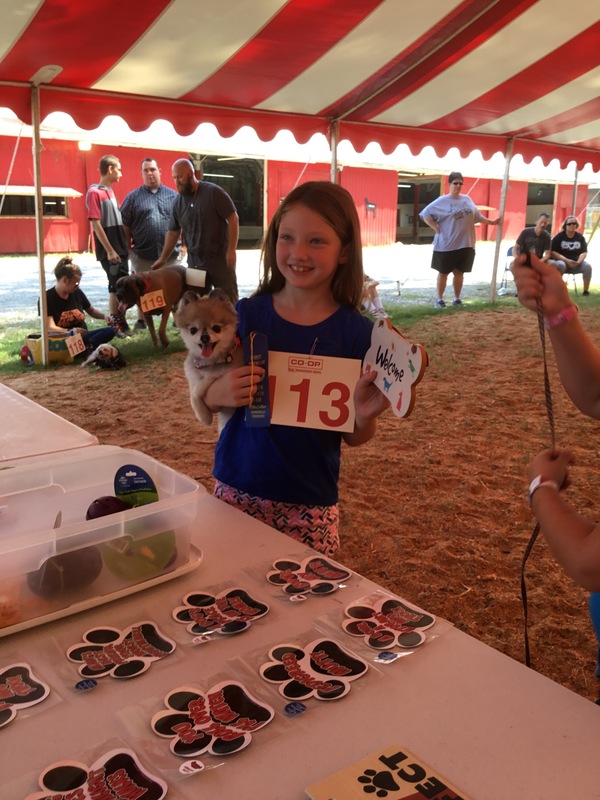 Sevier County Humane Society Dog Show gets two paws up! 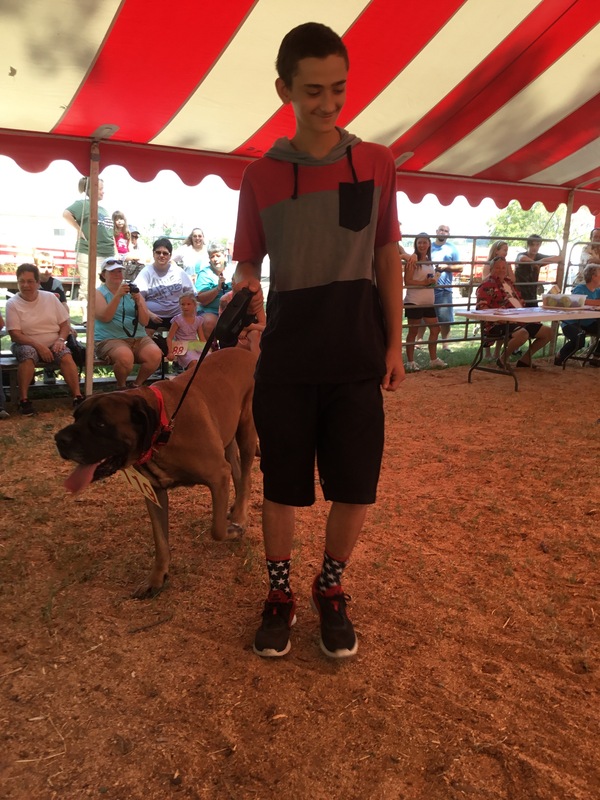 We saw some great dogs on Saturday at the Sevier County Humane Society dog show! First of all, here is a link to their website and Facebook page. I parked close to the tent because the fair would not open for two more hours. There is always a jar in which to make a donation so I did that as I walked in. The judges, pictured here, were ready to begin the show. Contestants were getting warmed up. Friends and family took their places on bleachers. Prizes were waiting to be awarded. 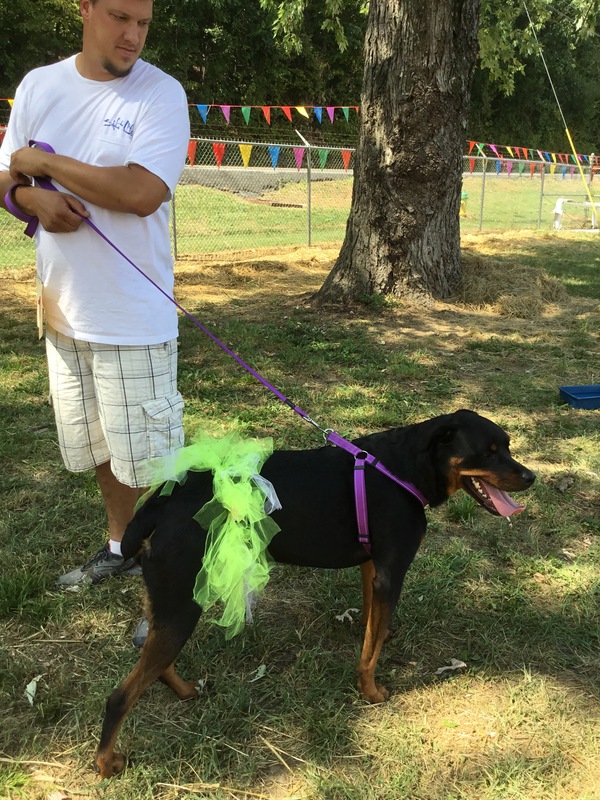 Ava ,the Rottweiler ,didn’t seem to mind her tutu. Gaia, the Great Dane, was very well behaved and walked well on a leash. 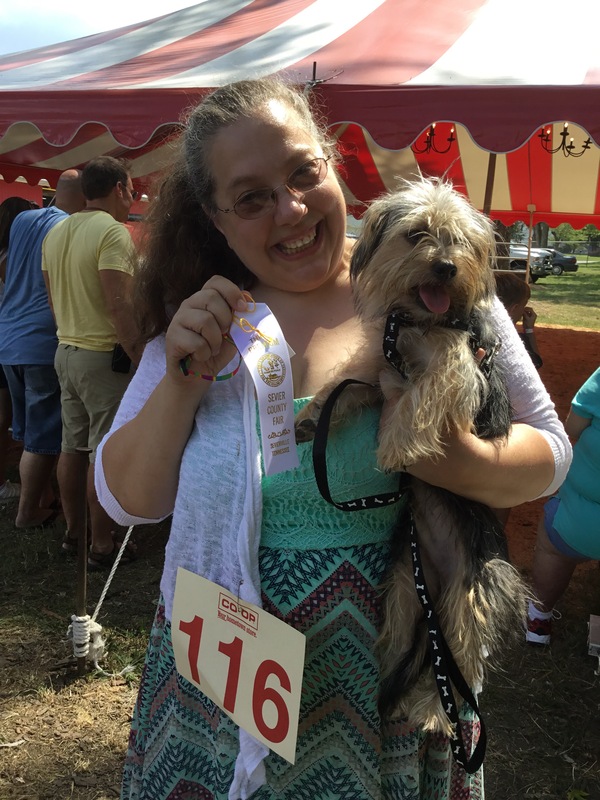 She won second place in the large dog contest. I think this was Doxie, 19 years old! What a sweetheart! 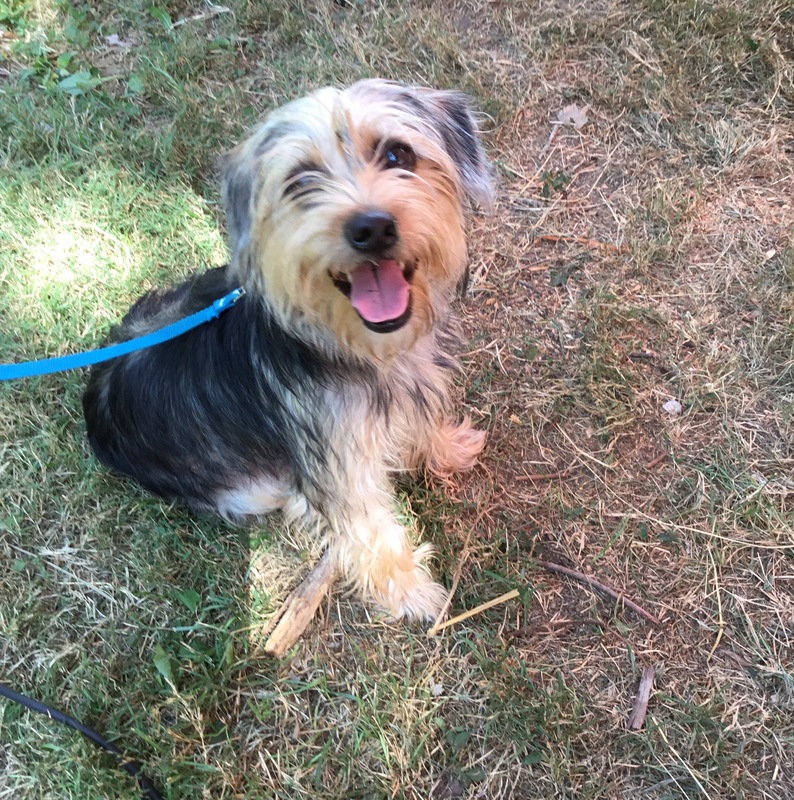 Maggie Pie is a well behaved Yorkie mix. Kia is an adorable Pomeranian. It would would end up winning an award. 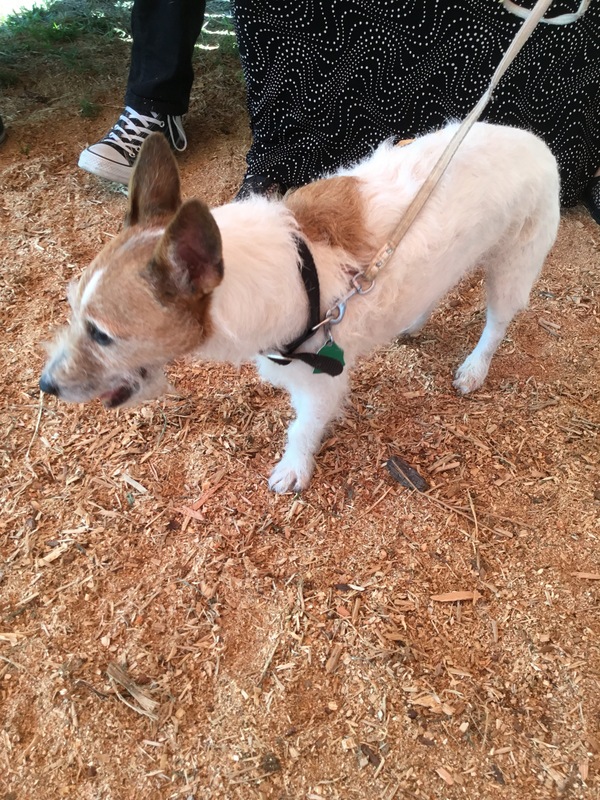 Kameko is a 16 year old Jack Russell terrier. So sweet. 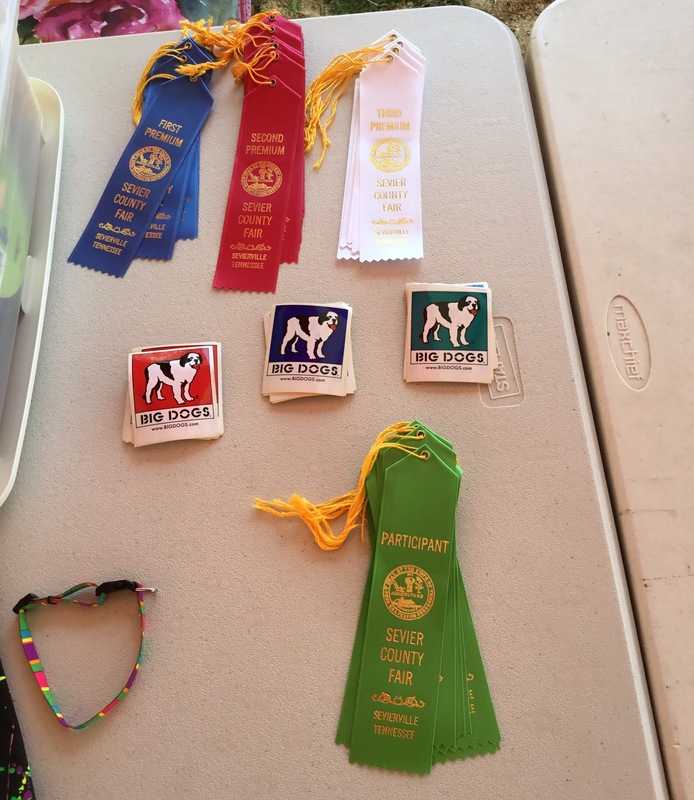 Only one dog was signed up for the Best Trick category. Gaia won best trick. 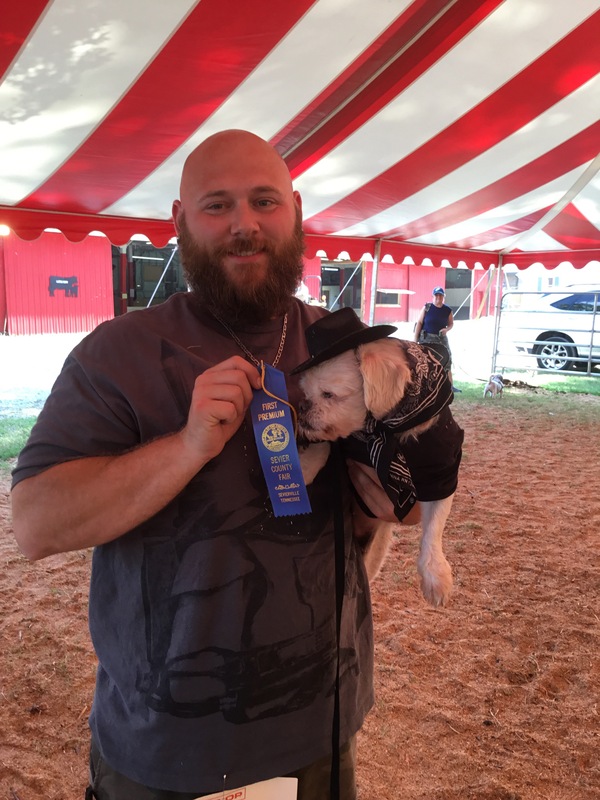 Start getting your dog tricks ready for next year! Lando is a 4 year old Bull Mastiff adopted from our shelter. He weighs about 150 pounds! The family always adopts from the shelter. Calling out the winners. 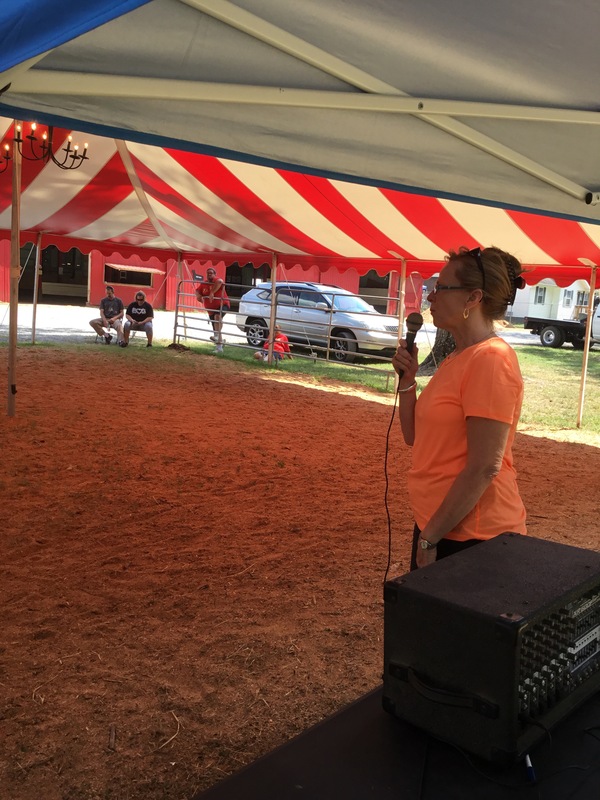 Plus, telling the crowd about opportunities to foster puppies and kittens . This is to give the babies a good chance to stay healthy as well as to socialize them for their new homes. 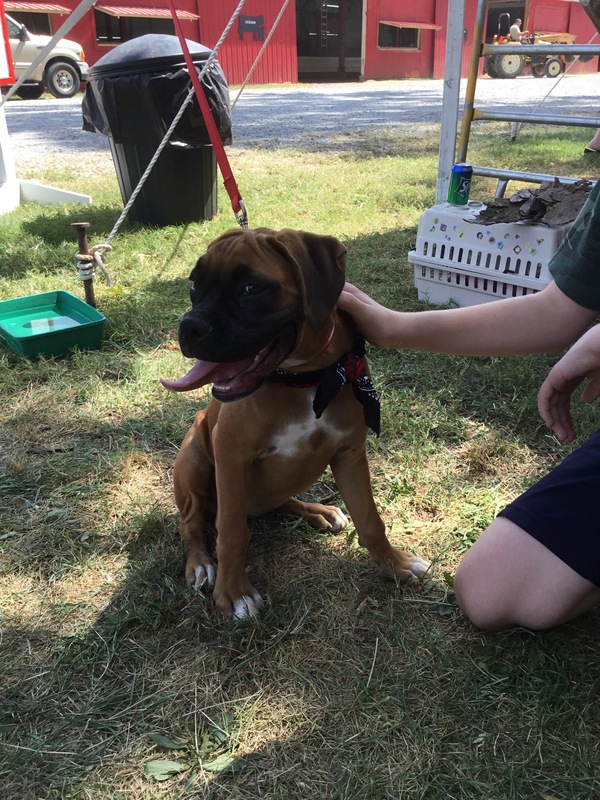 Bella is a 4 month female boxer. Look at that friendly face! 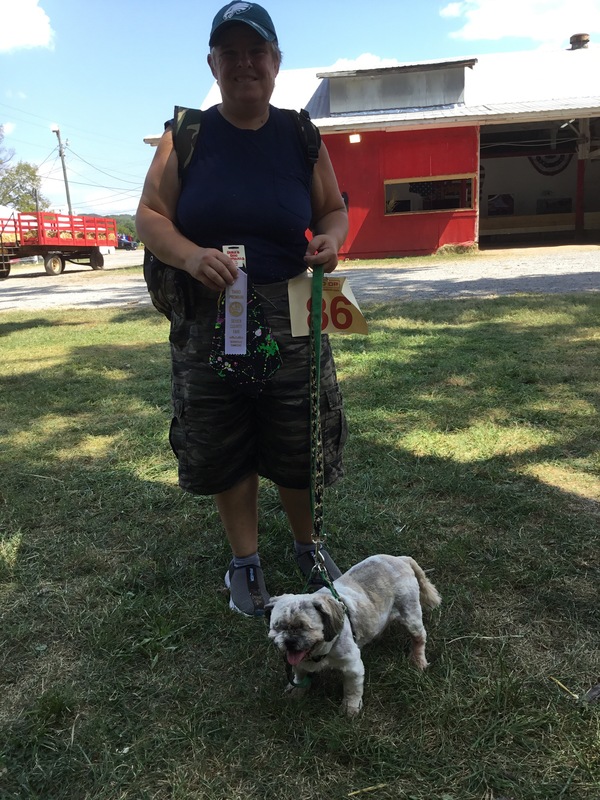 Bruiser wins a prize, tying with Fanny. 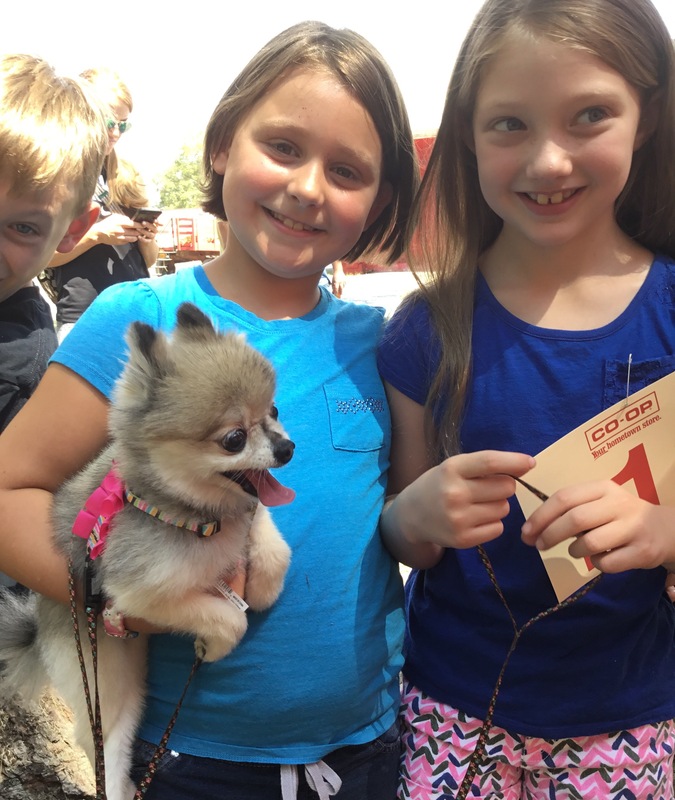 The Humane Society reminded us of the information on their website and animals that you can see at Petsense for adoption. 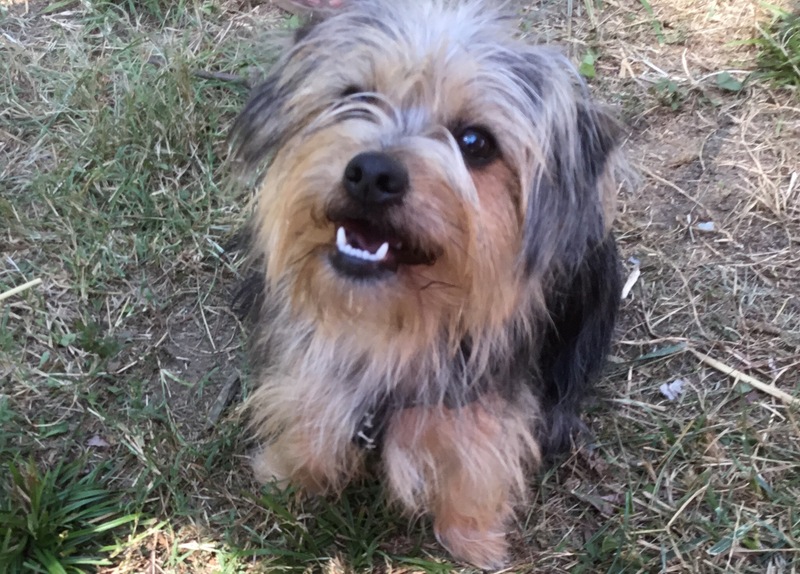 Don’t forget to give your dog monthly heartworm medicine because even one mosquito bite can start that painful and deadly canine illness. The shelter can always use volunteers to walk dogs, play with cats, foster animals, or help with fund raising events. 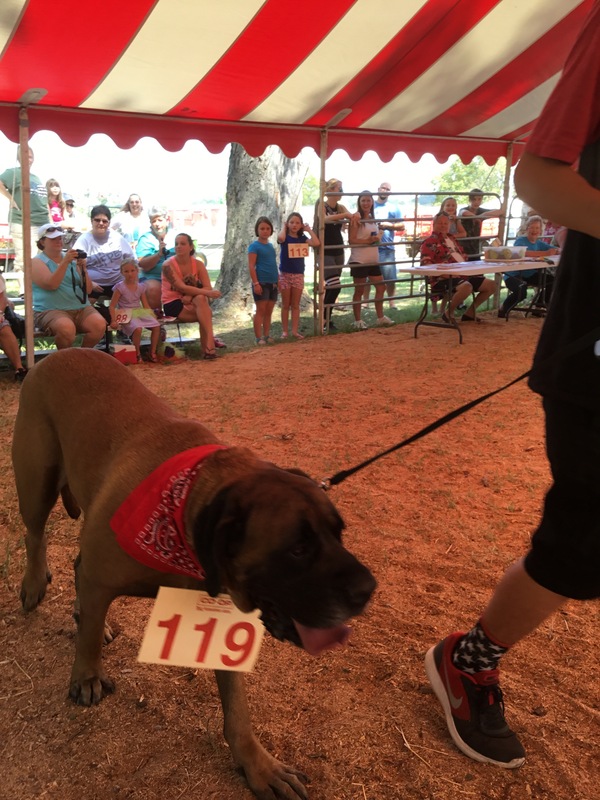 Bring your dog to the Humane Society Dog Show next year. 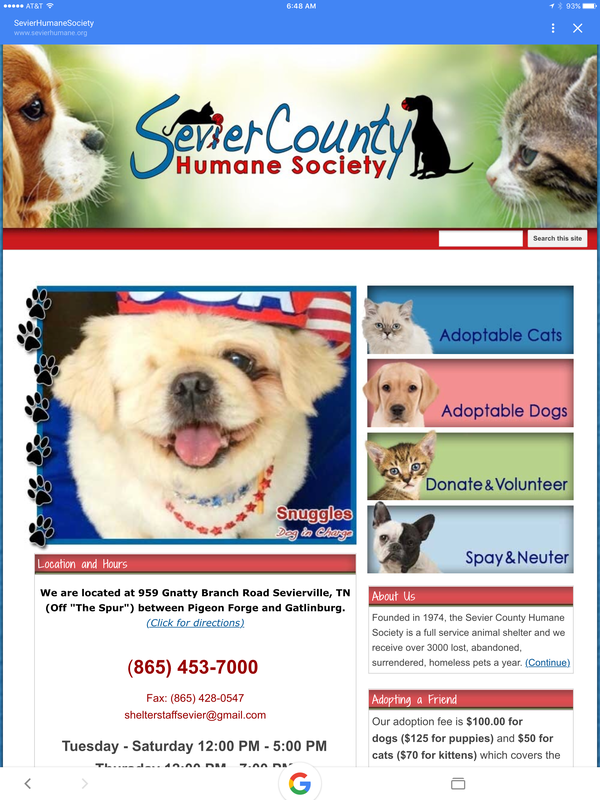 It is a fun way for you and your fur baby to get out and about in Sevierville together. See these pictures and more on the blog Facebook page for Out and About in Sevierville. Below is the link. 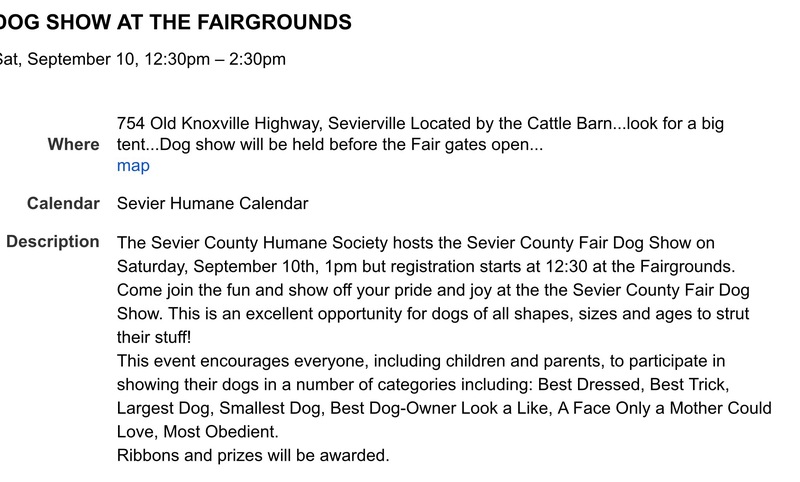 My favorite event at the Sevier County Fair is tomorrow—the Sevier County Humane Society dog show! I attended last year and was completely delighted. 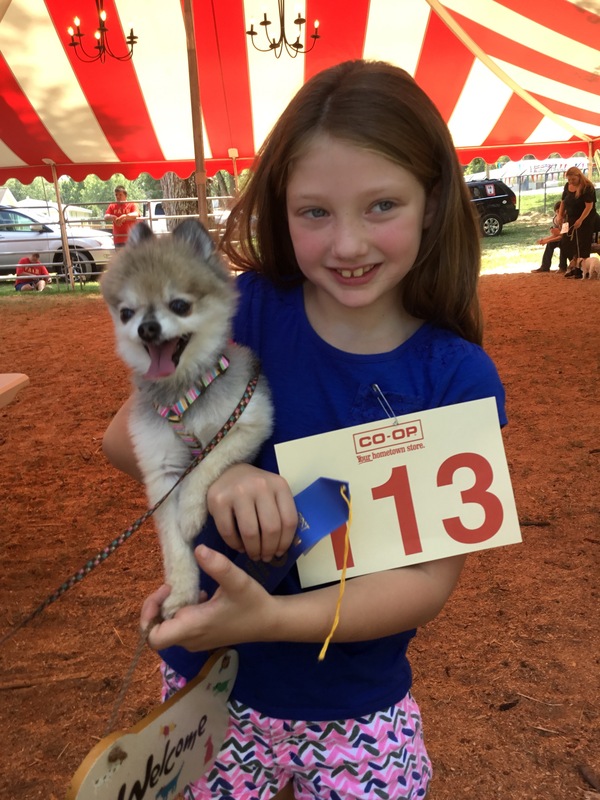 If you or family members love dogs then you need to see this event! It is free and you can park pretty close to the gate because the fair doesn’t open until 3:00. I park close. I make a donation at the door. 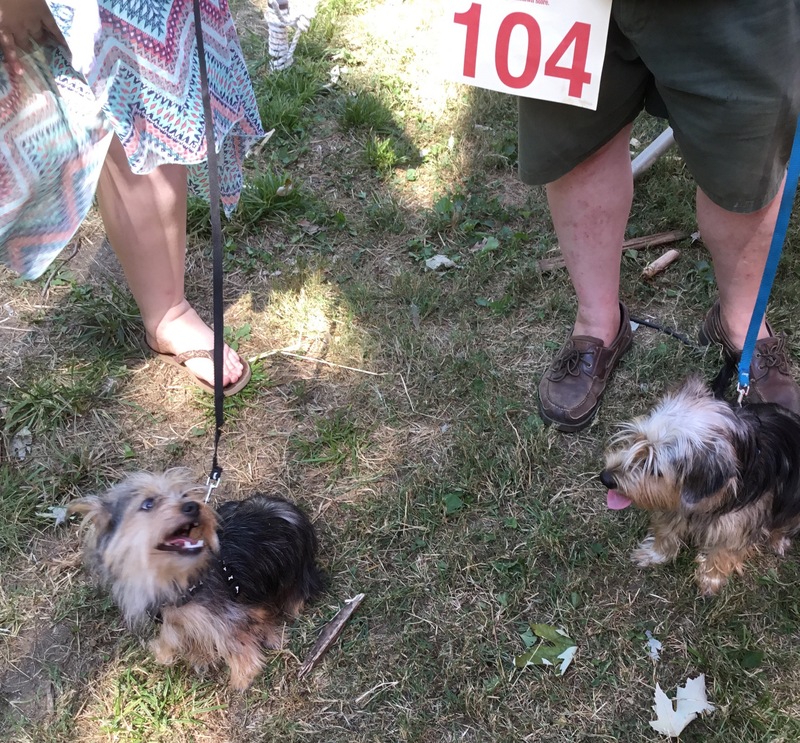 Mingle with pet owners and see cute dogs. Sit on the bleachers and watch the show! 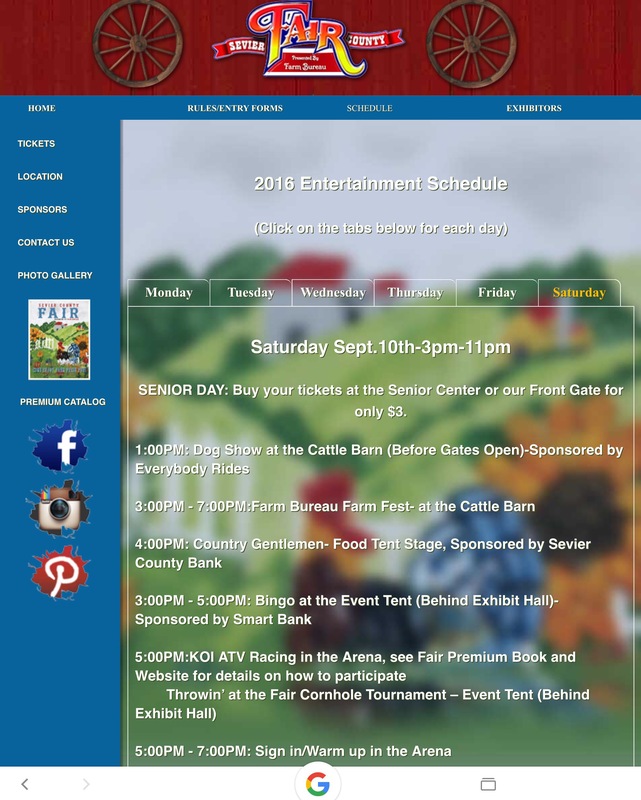 The Fair website says 1:00, but the Humane Society website says 12:30 so get there early. 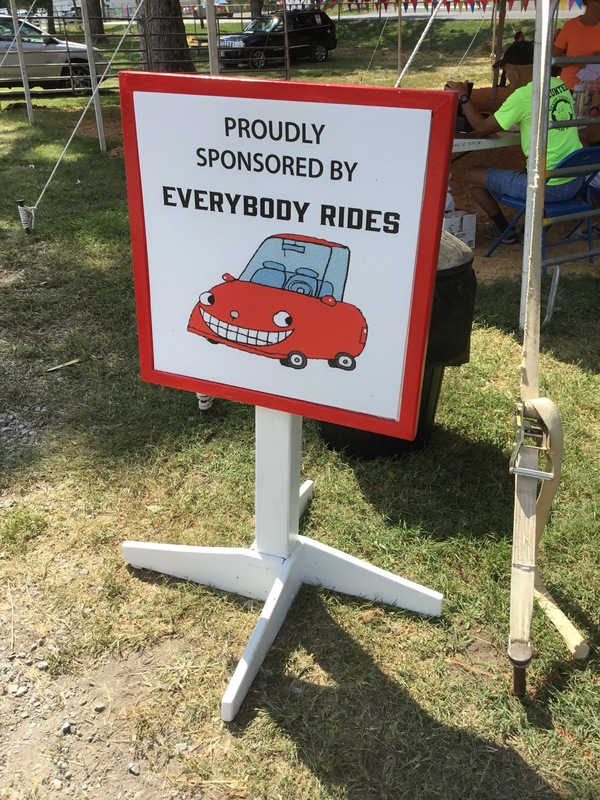 You can park near the gate and enter the Cattle Barn free because the Fair does not open for a couple of hours. 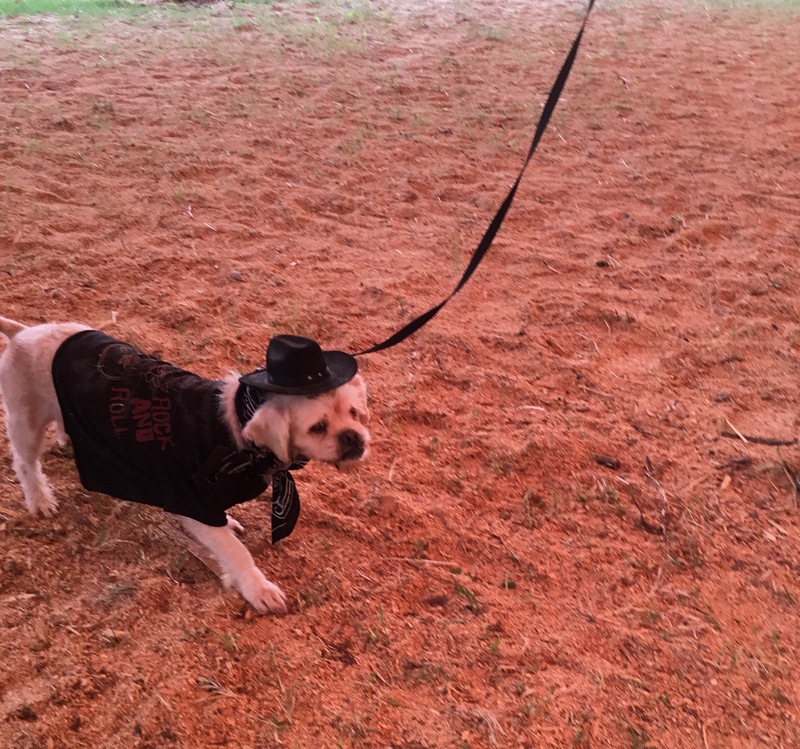 The dogs are so cute and I was inspired to teach my older dog some new tricks. 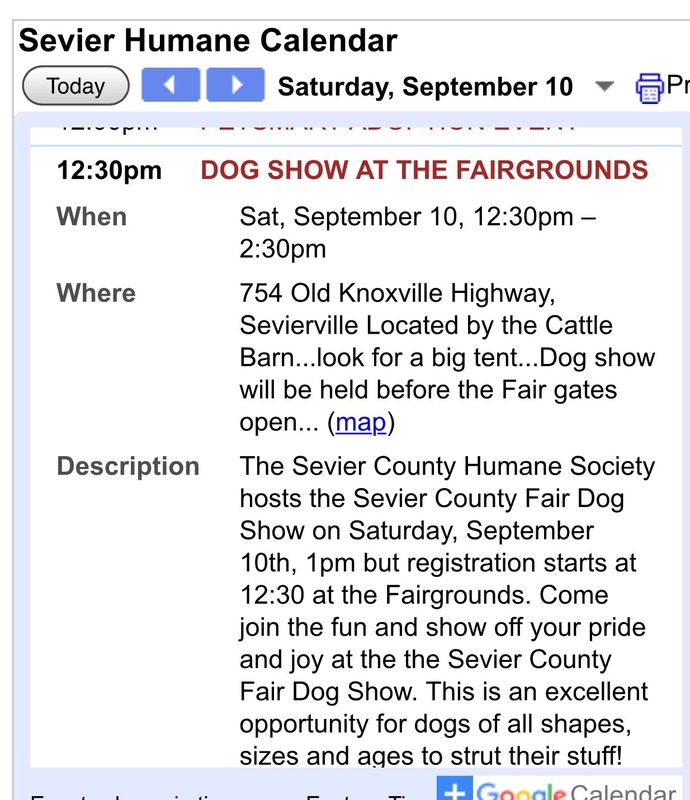 Get out and about in Sevierville tomorrow and see this fun event for the whole family. First stop at the market found unique jewelry, some pieces using Indian nickels. There are some in the upper, right picture below. 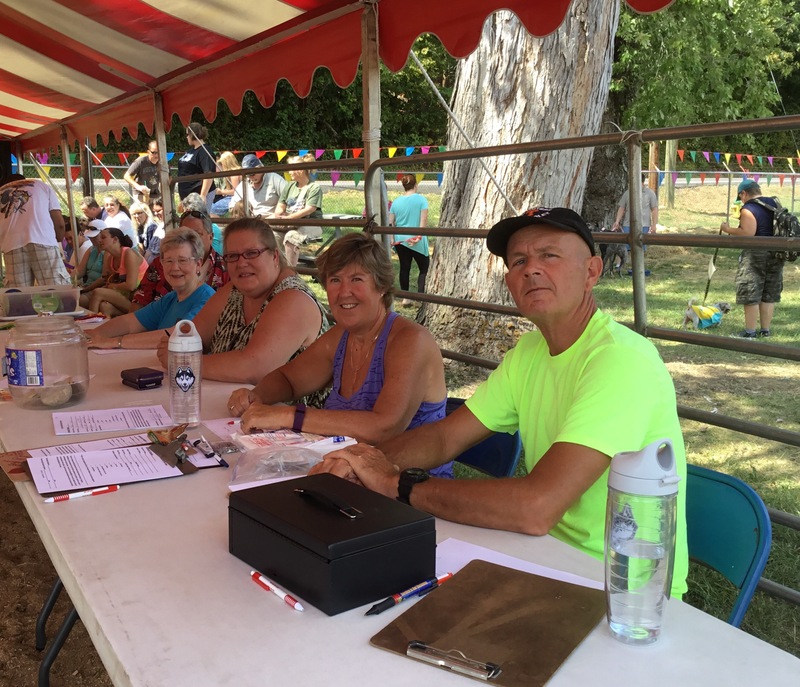 Members of the Sevierville Commons Arts Council at their table to promote the group as well as the upcoming Art Crawl at the Commons. They screen printed these shirts. Love them! Heirloom tomatoes from Belmont Farms in Jones Cove. Last month, a vendor who makes animal figures took a sketch of my dog, little Dolly, from a picture on my cell phone. It was ready for me today! It was only $5 and I was delighted with the figure! Below is my dog figurine in a larger size so you can get a better view. Some nice orange and white accessories. Go Vols! Then, my friends and I made our way back to Courthouse Donuts for lunch. We love the big windows, art, and a view of street and courthouse activity. Plus, the food! We tried the cuban sandwich, chicken salad on pretzel bread, and the spinach salad. Divine! The half and half combo is my favorite way to order too. Doughnuts are good! A new thing that I noticed was music during lunch in the back of the big room, Dyers Downtown. A talented duo called the Pea Pickin’ Hearts performed a variety of tunes. I have heard of them, but had yet to hear them live. What a nice way to spend the afternoon! The duo travels around the Southeast, spending 80% of their time on the road. We’ll try to catch them again when they are in the area. Truly talented and created a wonderful atmosphere in the room. I think that I have found a new -favorite- local- group! Here is a link to their Facebook page for more info, photos, and videos.